Something that generally lacks in traditional guidebooks is where to have a good nap! Especially for a big walker and cyclist like me. Thus I decided to show you my favorite places for a good nap in Paris. The National Library of France is one of the leading architectural projects planned under François Mitterrand’s presidency. Made of four high buildings in the shape of open books, with a conifer garden in the centre of this rectangle, the spaces open to the public are at haut-de-jardin level (first level below ground floor). I wouldn’t advise you go there for books, because you’d have to pay an admission fee, and the BPI (at Pompidou centre) is definitely a better choice. But the corridors all around the garden are freely accessible, with a nice view on this “urban forest”, and above all equipped with very comfortable chairs, ideal for reading a book, using your laptop, chatting, and of course enjoying a well deserved nap! 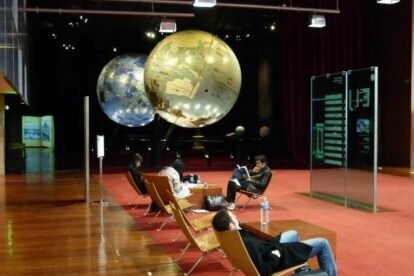 This space also hosts a bookstore and a cafeteria, and exhibitions (some are free) about literature, comics or press are often displayed in the corridors (mostly in French), including the impressive Coronelli globes (see picture). Although not very central, the automatic metro line 14 (never on strike!) will bring you there quite rapidly from the town centre, and it’s a good occasion to visit this modern Parisian neighborhood, recently embellished by the modern pedestrian Passerelle Simone de Beauvoir.